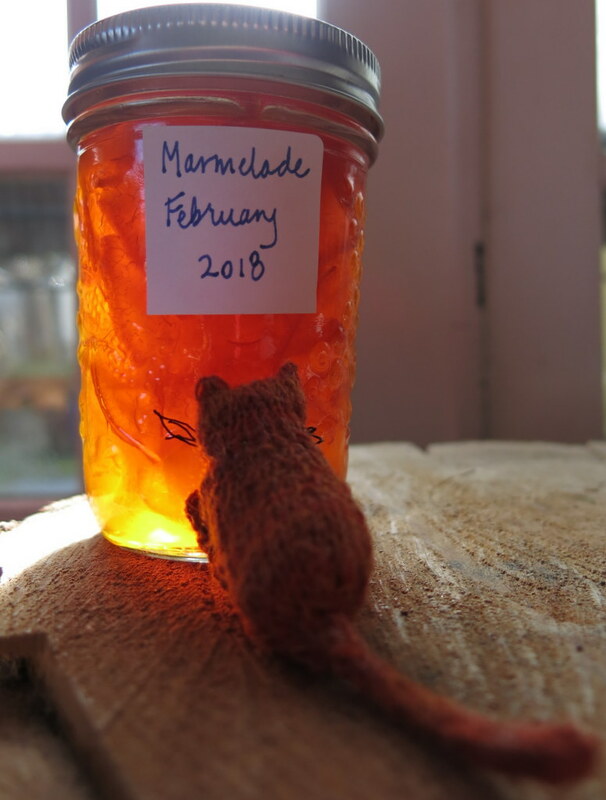 …and ended up with a marmalade cat, and by strange coincidence, also acquired a jar of Marmelade from a friend! …and introduced him to the rest of the clowder!!! Beautiful clowder of cats…and a magnificent word learned in the process. The cats are indifferent to the Hittys, but they love them! I don’t even know how they end up with such funny little cat-like behaviours since they are “just a bit of yarn”. This marmalade is a perfect match for Aurelia! And the grey calico looks like our real feral cat, that showed up here and is now tame. I guess I need to name her. hmmmm have the Quimper Hittys ever heard of Crazy cat ladies?? hee hee.. I love the cats, all of them and your new little Marmalade is very sweet. The HIttys are so lucky to have such a talented knitter for their human!! The Quimper Hittys are enjoying the appearance of all the cats! They haven’t been staying in the Quimper Hitty cupboard for very long, though we will probably end up with a few permanent residents. These little kitties are so cute. I want to reach right through my computer and pet them. I live in a retirement community where we have lots of pets. Some of the cats go out on the prowl and we thought that one of them, who we named Waldo, was homeless…only to find out that Waldo has three homes (that we know of so far) That answered the question why Waldo is “So well fed”. Waldo follows the residents and comes up to get his head scratched (he loves that). He watches us garden while he lies under a shade tree. He is just a great little spirit. I love all the posts with the hitty kitties. 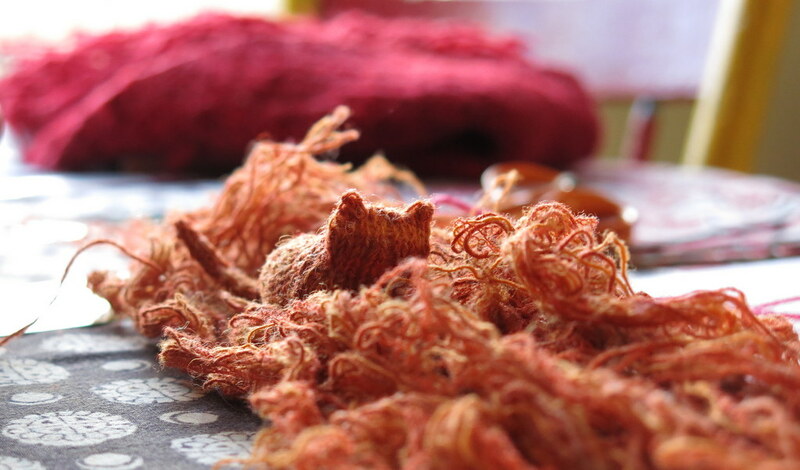 The Marmalade cat may take after Waldo – he seems rather well-fed too! It has been fun to find a knitting pattern that gives me (and the Hittys) so much amusement! 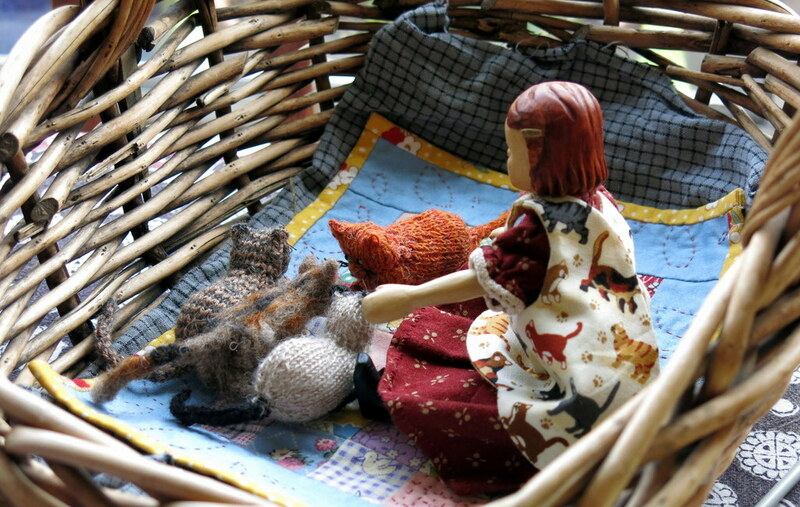 I love all your knitted cats. I looked in Tutorials hoping for info to make one myself. I didn’t find one for the kitties. 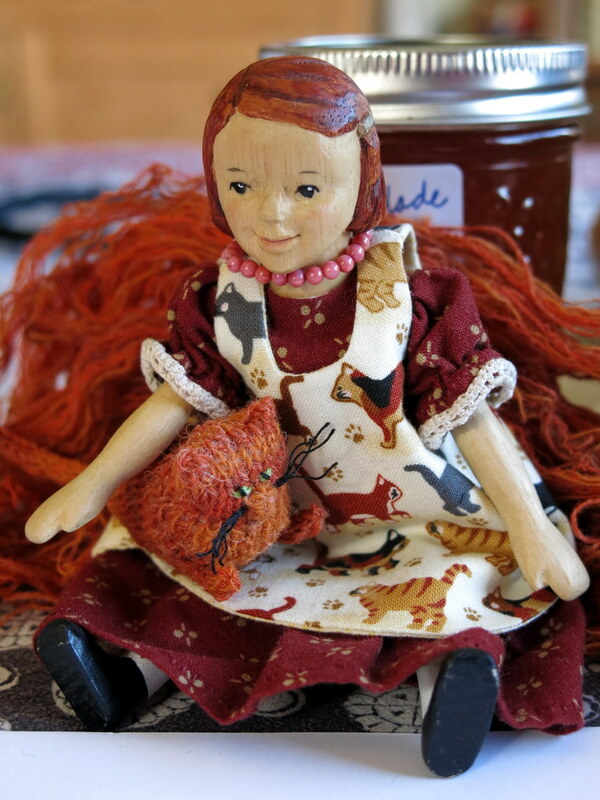 Marmalade is perfect for Aurelia. He looks similar to Omar, our orange cat, who has passed on to cat heaven. We still miss him, even though 2 have 2 fun cats now. You are a great knitter. I am working on being a good knitter! I hope the pattern works for you!! More kittys makes for happier Hittys! We’ve been close companions with two fine marmalade cats. Rhubarb came into our lives as feisty pink kitten, as pink and stripey as the rhubarb I was shoveling into a pie shell that very morning. Beaker arrived years later…she was a fine, FAT cat who traveled all the way from Korea to Alabama…very fond of insinuating her girth into the smallest possible box, then chewing the box to little bits. As an aside…you really should ask Celia to share some Omar stories…if a cat could be a card, Omar certainly would be! I have never been the human of a marmalade cat, but have been acquainted with several of them…and without exception, they have been fine, often ample, and always affectionate felines. 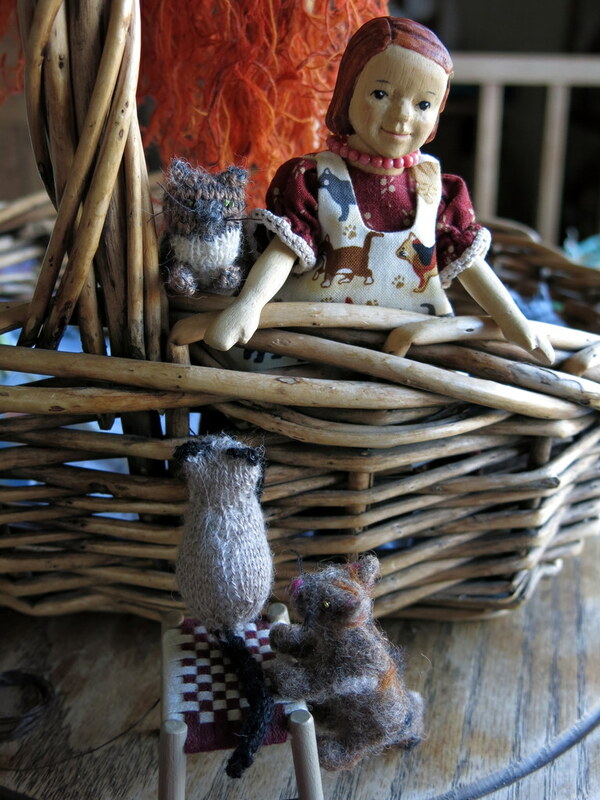 Rhubarb, Beaker and Omar all sound delightful, memorable and charming.